It is not all glory in the waves while paddling my wooden kayak along the shores of the west coast, there are some land-based thrills as well and one of my favorites is exploring the beaches. 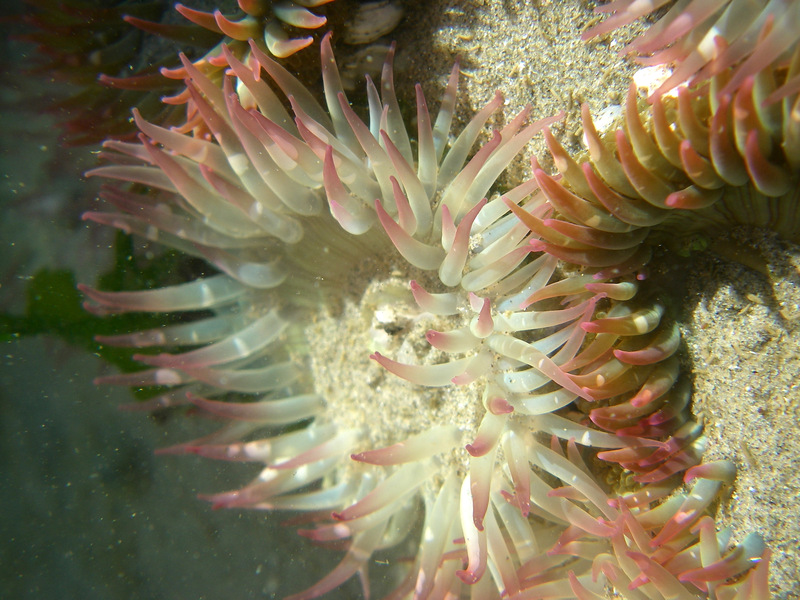 Something the kayaker interacts with, hopefully gingerly so are the intertidal zones. 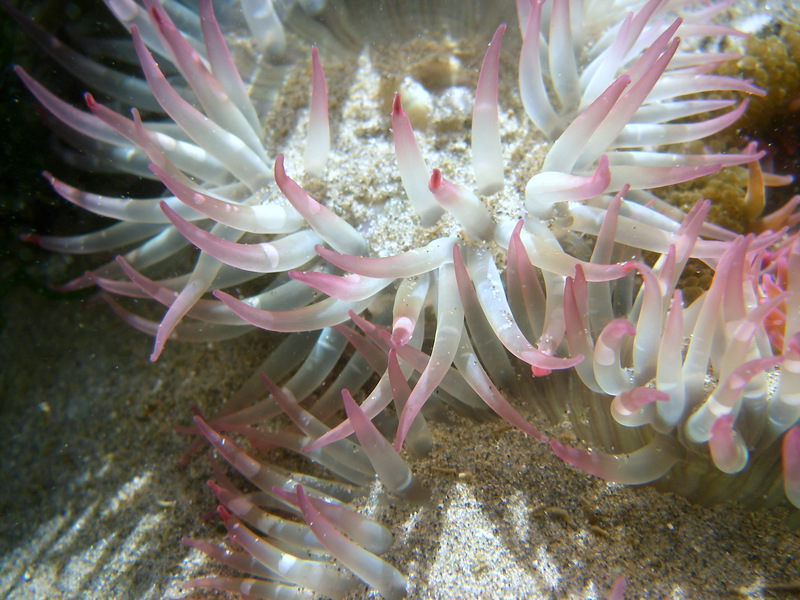 This most precious and fragile area that is neither in the ocean, nor entirely on land. It is the limbo between the moon’s comings and goings and in incoming and outgoing tides. Pockets of sand, or divots in the rocks or deep holes eroded over time that capture eco-systems of their own. 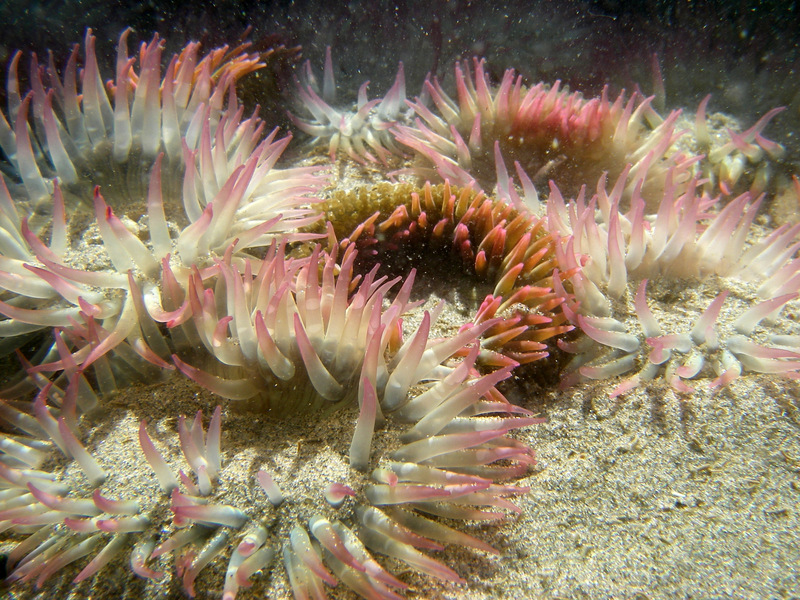 What lands in them as the sea climbs the beach are fish, crabs, shrimp, shellfish, sea anemone , grasses, and assorted hearty underwater life that don’t mind the pools heating up during the day while exposed at low tide. On a trip to Tofino I found a humble tidal pool at the end of the tombolo (sand spit) that connects North and South Chesterman Beach with Frank Island. Chesterman Beach, unlike the famous Long Beach in the Park does not come with parking fees and is equally spectacular, pleasant and less populated during the tourist season. Although in this section of Vancouver Island’s skirting of bare sand stone is covered in sand it is not easy to find these tidal potholes. 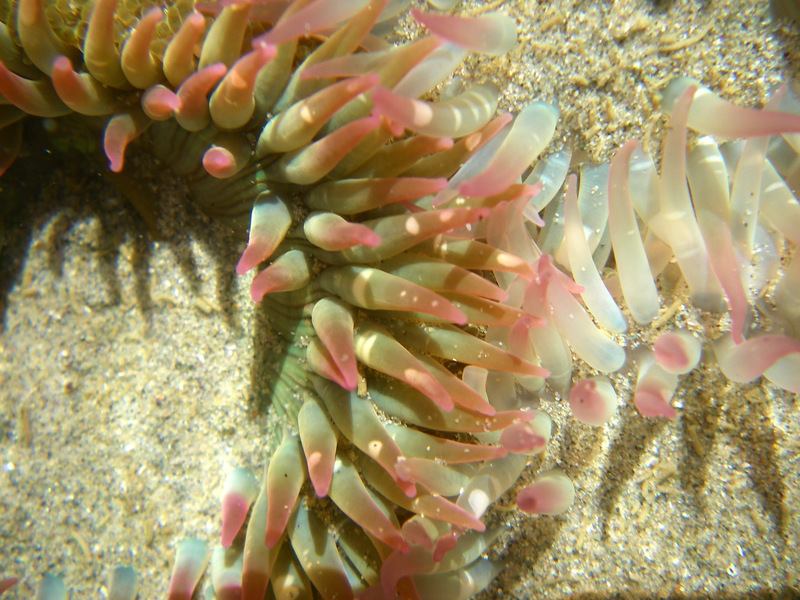 However, at the fringe of Frank Island nestled in the exposed rocks I found a sandy anemone garden. A few hermit crabs wandered about and skittish fish darted away when I lowered my camera under the water for close-ups. Here are some of the results. When I think about Tofino, BC many images come to my mind’s eye in an overwhelming stream of memories from childhood wanderings and play on Long Beach (now Pacific Rim National Park) amongst the hippie kids and resident squatter community living a sandy lifestyle of the mid-70’s, and my more current experiences kayaking the area. Much has changed in the little village that is quite literally at the end of the road to the west side of Vancouver Island, and much has remained the same. 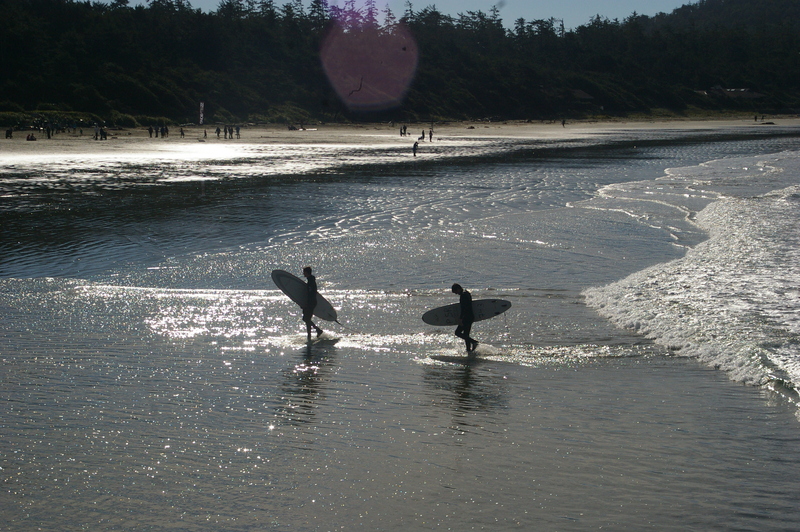 Time and tide are the constant though Tofino endures an annual invasion of summer tourist that whips the local routine into a frenzy. Campsites are bursting to overflow, beaches packed with wanderers and surfers. The town is populated with bus tours and backpackers. But in the fall, much like my home on Salt Spring Island, which is also a tourist destination the flow slows. Regulars in town reappear after a summer hibernation and everything returns to a normal pace. 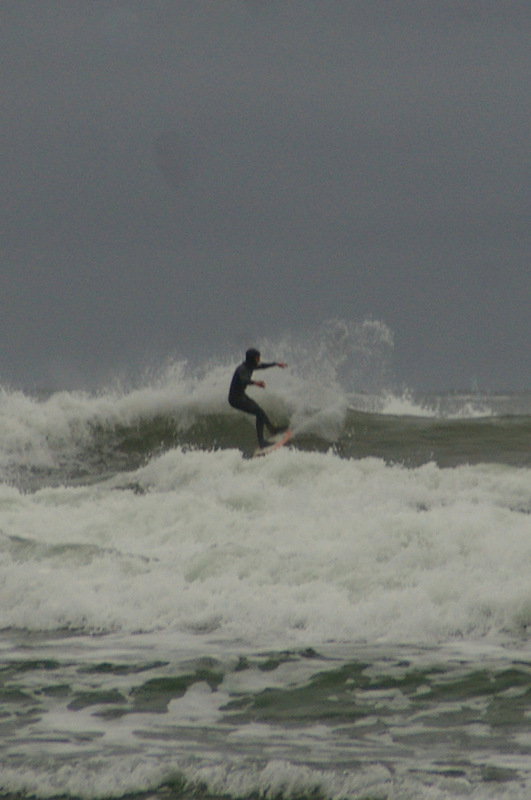 In the case of Tofino that pace remains humming as the ‘storm-watching’ season begins. The surf warning sign is changed from low to moderate or even high, the campsites are plentiful and the air is always clear and crisp. 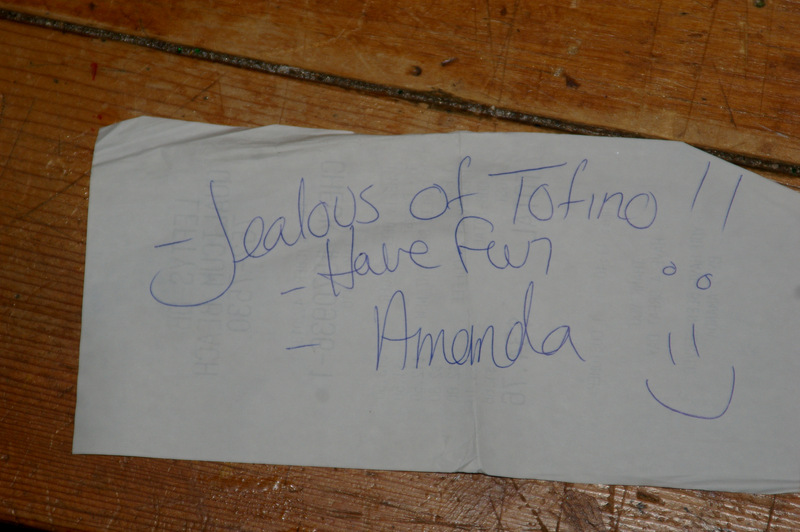 That is the first thing that hits me each time I set out on whatever beach I am closest too upon arrival in Tofino. The air at home is still, rainforest calm scent of trees and seaweed. Out there on Chesterman’s Beach, McKenzie Beach, Cox Bay or Long Beach the air is like a chilled white wine by comparison to my luke warm Merlot air of home. West coast Pacific air immediately refreshes the spirit and it all seems somehow brighter. Last week my wife and I revisited the place of our honeymoon and the familiar scene that welcomes us even after a two-year absence. We set up camp near the ocean and our soundtrack that first night would be pounding surf mixed with the rapid attack of raindrops on our tarp. By morning, nothing but high clouds and mild temperatures greeted us as we sipped coffee at the Common Loaf Bakery in town before heading to Cox Bay, home this year to the Queen of the Peak women’s surf competition hosting wave riders from all over, with the high content of local talent. The first day of the meet was the short boarders hitting the larger waves of the weekend following some stormy days. This was my first experience watching real surfers doing what they do best and the show did not disappoint. The joy, smiles and pure athleticism of these women was astounding. Making the paddle out through a rockery to sneak out behind the incoming sets of waves was made to look easy. The rides were in some cases long and the return paddle to get the next wave equally daunting. This was a trip that led me to Tofino at the head of one of best kayaking destinations around, Clayoquot Sound once more without my kayak on the roof rack? Though I was not there to paddle the Tofino experiences only added to the library of lovely memories from my first sight of the endless beaches when I was still in single digits and all the way to present day when I can share the experience and love of a place with the love of my life. But next time I am taking my kayak! Catch the Wave of your dreams and ride it until it breaks. I have paddled many times on the west coast of Vancouver Island in the past decade or so. Though the beaches I have landed upon are familiar territory the landscapes of them are never the same twice. Tide, wind, and winter storms shape these places birthing them seasonally. In the spring it is the most evident that a birthing had taken place over the wet winter months. Silent in the changes a log that was once half-buried the summer before has gone out to sea or moved along the beach for a year of new perspectives and a refreshed view of the water. On a week spent on one such beach I was gifted to witness the changes, daily during days and nights of winds and heavy rainfall that drummed on my kayak deck in the faint early morning when I could not sleep and opted instead to brew coffee under the tarps. Sand shifting and exposing treasures such as urchin remains, beach combing treats and a few bottle caps. The tidal creek that ran parallel to the shore widened and virtually vanished over a two-day period, only to reappear the morning we decided to take advantage of a window and skeedaddle home. I never regretted the sudden stop in out journey and eventual cancellation of our route due to ongoing Mother Nature’s fury. It played to my kayaking aesthetic of paddling to a place and taking the time to soak it in. Well, I was soaked most of the time but enjoyed the feral nature of where I was, and how simply life can become at that stage on a far-flung beach. 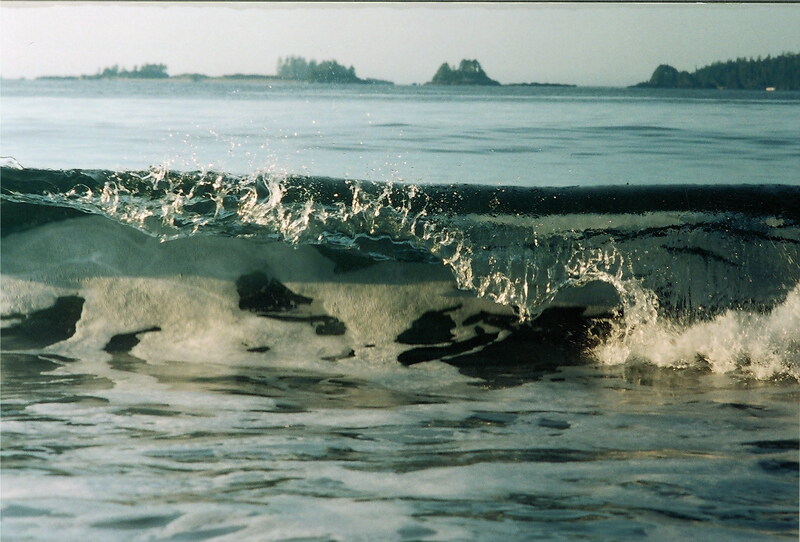 Morning surf rolling in at WhiteSands Beach, Flores Island, Clayoquot Sound BC. The flip-side of that week was ten-days of glorious sunshine only once interrupted with an evening of drizzle, and then back to sunshine. The paddling was incredible and we revelled in our luck to land on a surf beach, intact and relatively dry for once. Coming from sheltered waters practice in surf was impossible so each of us found our own way in. That afternoon we sat in hot sand, watching a calm sea swells meander by without a thought to us. The next morning I was again first to rise, restless from my tent and making a brew under blue skies and sand bathing the skin between my toes. I walked the beach with my camera (analog if you can believe it) and a spilling mug of coffee. I planted myself in the wet pavement-hard sand as the tide receded away from our camp. There I patiently waited for the wave of my dreams to wrap itself on the sand with a thunderous noise. I took several images not knowing for certain as it was film not jpg, and there was no instant gratification verification of photographic success. A week later I sifted though the photos of that trip and lo and behold, the wave of my dreams rolled towards me, frozen in time.